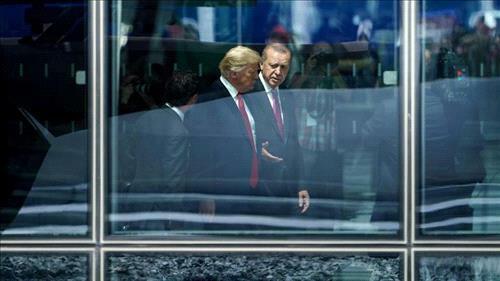 AMMONNEWS - Turkish President Recep Tayyip Erdogan said Tuesday that Ankara would set up a “security zone” in northern Syria suggested by US President Donald Trump. Turkey has welcomed the planned withdrawal of some 2,000 US troops from Syria but the future of US-backed Kurdish militia forces regarded as terrorists by Ankara has poisoned Ankara-Washington ties. Trump on Sunday tweeted that the United States would “devastate Turkey economically if they hit Kurds”, a threat that drew angry retorts from the government in Ankara. Erdogan on Tuesday said Trump’s tweet “saddened me and my friends”, but added that the two leaders reached an agreement during Monday’s phone conversation. “We have reached an agreement of understanding that is of historic importance,” he said. Erdogan said Turkey would solve issues with a “spirit of alliance” with Trump as long as his country’s sensitivities were taken into account. US support for the Kurdish People’s Protection Units (YPG) during the Syria conflict has been a major source of friction between the NATO allies. The US regards the YPG as an effective ground force in the fight against ISIS. Ankara has however threatened to launch a cross-border operation to eradicate Syrian Kurdish fighters it sees as an offshoot of the outlawed Kurdistan Workers’ Party (PKK). The PKK is blacklisted by Turkey as well as by the United States.